Balanced pH level is important to maintain a suitable environment for a healthy, functional body. Therefore, it is important to consume foods that consist of proper pH value. 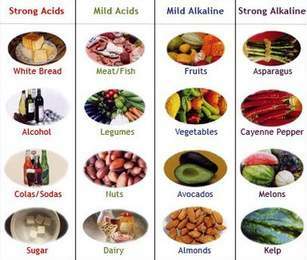 So today I’m going to list several alkaline food that can be consumed to maintain a healthy pH level. Broccoli’s pH level is 6.0-6.8 which is good to maintain a balanced body pH level. It also contains omega-3 fatty acids that helps keeps body inflammation at bay. Other than that, Celery is also one of the well-known alkaline foods which consist of great source of anti-oxidants and enzymes. Celery is also rich in vitamin C and B6, potassium, and folate. Celery are good for people who want to lose weight because more energy is required to process celery consumed. Garlic is another famous healthy alkaline food. Consuming garlic on daily basis improve insulin sensitivity and lower diabetes risk. Therefore, people with diabetes should consume at least several cloves of garlic per day to increase their insulin sensitivity. Kale is good for people who are undergoing low calorie diet since it contains zero fat, high in fiber and have excellent source of vitamin K.
Cucumber which we use on daily basis made mostly of water and mineral which helps our body to maintain a proper pH level. Cucumber is rich in vitamin A, B, and C and it is also loaded with potassium and magnesium. Last but not least, Avocado is also well-known as super foods since it contain more than twenty different vitamins and minerals. Avocado also is known for it good source of fat which is mono-saturated fat and fiber.